Grandes lignes: English translation of a Hungarian recording. There was an article in a magazine titled 'What does Jesus Christ mean to you?" Some answers. It is a personal relationship with Jesus that is important. God forgives our sin because of the cross. Story of the rich young man. Story of Nicodemus. Ce texte est la directive de base pour la traduction et l'enregistrement dans des langues étrangères. Il devrait être adapté selon différentes cultures pour garder sa pertinence. Certains termes peuvent être ajoutés ou retirés pour parfaire le résultat. The message starts with a few introductory sentences, and then there is a song on "The Cross." After that, the message starts telling of an article he saw recently in an R.C. magazine (Hungarian) in which a question is asked. The author had conducted a poll among a cross section of Hungarians, including some university professors, poets, and intellectuals, asking, "What does Jesus Christ mean to you?" There were several answers published in the article, from atheists, nominal Christians, poets, etc. One of the answers was very interesting, and the man said something like this: "The real meaning of Christianity is some kind of personality. It is not only a way of thinking, or some kind of philosophy, or different moral rules, it is Jesus Christ Himself." And in my message, I would like to follow this line. Jesus Christ is not only an historical person for me, but, much better, He is the Son of God. I go a step further - He became a very personal Saviour to me. He is not only a wonderful person who lived in history some time ago, but He came into my life, the real Saviour. For a long time He was just an interesting person until one day He came into my life, and I realized that the idea I have about Christianity is not the most important thing, but the real question is, "Did I meet Jesus Christ or not?" Actually, the meeting with Him is the most important, because if I do not meet Him here in this life, I will meet Him after death. The Bible gives us a clear picture of what kind of meetings will take place after our death. Then we will not have the opportunity to meditate on the question: "Who is Jesus Christ for me," but He will ask us the question: "Who was I, for you?" So I would like to change this original question, "Who is Jesus Christ for me?" Let me give a chance to this Jesus Christ, that He may take this question in a very personal way, directed to you: "Who am I, for you?" I want to give my personal testimony, saying that I know that this question has great power in it. I wasn't able to turn away from this Jesus Christ. His righteousness, love, and goodness broke my heart. I realized how sinful a person I was. It wasn't an easy experience for me. Finally, I realized the real situation. I compared my sinfulness with Jesus Christ's righteousness, and saw that I needed help. It was very logical for me to ask Him to help me. It was interesting that this sad experience of seeing my sinfulness didn't paralyze me, but made me free to discuss my problems with Him, and we had many things to discuss. My sin was my greatest problem. It didn't take a long time for me to understand the real meaning of the cross, and why Jesus Christ died for me on His cross. I had heard this story quite often, but it took a long time for me to understand the real meaning of it. I saw that God forgave my sin because of the cross. It brought a great joy to my heart. 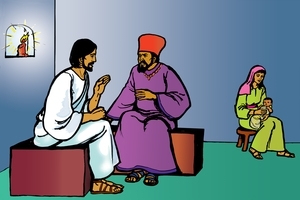 After this first meeting with Jesus Christ, there followed several other new meetings. I found that I couldn't do anything without Him, and later on this relationship stabilized, between Him and me. I came to know what it was, that He is in me, and I am in Him. It is a case of symbiosis, where two living beings are living together in a very helpful way. This is an illustration from biology which shows that Jesus Christ and man can live together, one within the other. He mentions this several times in the New Testament. Here, there is the song about Jesus Christ. His name isn't mentioned , but everybody will understand it is about Him, and this relationship. For the writer of the song, and for myself, Christianity is not some kind of philosophy, but we are Christians because we are following Him. If our Christianity was only a faith in different Christian doctrines, we would have the same problems as the Jews had, who were blinded by their own religion so much that they didn't know what to do with the Son of God Who came among them. Their religious system became so lifeless that the living Son of God, Jesus Christ, didn't fit into it, so they had to throw Him out and crucify Him. We should know about this historical situation, because there is a danger in our Christianity today, that if we bind our faith to something and not to somebody, our religion will become just as lifeless as Judaism when Jesus came down to the earth. We don't know what to do with Jesus Christ, and we might follow those who say He was a great person, He was a great prophet maybe, but He cannot help us today. Those who met this Historical Christ, but never met Him as their Saviour, have a false picture of Christianity. I can imagine that this is a new idea for some of you. If I tell you a story from the New Testament, you may understand what is the difference between real Christianity and our self-righteous religion. The end of the story tells us that what is impossible with men, is possible with God. I am glad that this sentence is there, at the end of the story. Otherwise it would be a very sad story. Reading this story, many questions could be raised. Who then could be saved? Who can follow Jesus Christ if the divine standard is so high? Is it not enough to have a normal religious life to be saved? Why is it a problem, if someone is rich? With these questions in mind, let me analyze a little, the person of this rich man. One of the biggest characteristics of this young man was that he was satisfied with himself, but still wasn't sure about himself. I think this duality is quite characteristic of most people. His richness gave him a protective covering, and if God had taken away the advantage of his richness, his personal life would disappear as well. Without his richness, this man would have lost himself. He suspected something about this, because he came to Jesus with this question: "What ELSE should I do to inherit eternal life?" It is so interesting to take a look at the conversation between Jesus Christ and the rich man. This young man greeted Jesus by saying "good teacher" and immediately he received a very interesting answer. Jesus denied his nice greetings, and with His answer it seems that the Lord Jesus broke the religious system of good works of this young man. If no one is good except GOD, those who are doing good works are as though they are not good, according to Jesus' answer, and it is not easy to understand. Two different worlds meet here together, and how difficult it is to go from one world to the other. It is also clear that Jesus didn't want to give help to this man, in his own religious system. There are many who may want to have a little help from Jesus, in their own lives, that they may go into eternal life into God's Kingdom, but Jesus didn't want to take the role of second pilot in our lives. He wants the FIRST place. Next to Him, everything else and everybody should have only the second or third place. We should give complete authority to Jesus Christ in our lives, if we want to follow Him. It is impossible to have my own way of thinking, and Jesus illustrated this impossibility by the parable of the camel going through the eye-of-the-needle. I cannot take anything, through the eye of the needle; I have to go just by myself. It is clear from this story that the rich man didn't want to lose his richness, everything he had. Jesus said "Whoever wants to save his life will lose it; but whoever loses his life for Me, will save it." So the rich man didn't want to follow Jesus. Seeing this, His disciples asked Christ, "Who then can be saved?" It was quite a difficult question, and they realized how difficult it was to enter into the Kingdom of God, for this young man. But they say also, that it was not easy for anyone. Jesus's answer showed the difficulty of this, for He says "It is impossible for man, but it is not impossible for God." No one can enter into the Kingdom of God just by himself, without the help of God. I am not able to solve my own problem, and I am not able to follow Jesus Christ -without His help. But with God, nothing is impossible. He can change my life, and He can make me a follower of Jesus Christ. After the next song by a Rabbi about the Master, I will tell you more. I gave a little talk about this man Nicodemus, what he did in Jerusalem, and what kind of Pharisee he was, and then I told about his coming to Jesus late at night, because he was very much interested in this Young Man, who brought such great trouble in Jerusalem, just a few days ago maybe, when He chased all the merchants out of the temple. Nicodemus had a lot of questions as to why Jesus attacked the Pharisees, and why He wasn't satisfied with the religious system of the Jews. But Nicodemus wasn't able to ask all of his questions, because Jesus said, "No one can enter the Kingdom of God without being born again." Nicodemus was really frustrated with this statement. It broke his whole religious system, just as in the experience with the rich man. And besides, for Nicodemus, this statement was a if we might say today, to a theological professor, "Dear Professor, it isn't what you have done - you must be born again." Nicodemus couldn't understand this, of course, so he asked, "How can an older man go back into his mother's womb?" It seems to me that his understanding was so far away from the divine standard that there were two worlds. These two men were as far from each other's minds as heaven is from the earth. Nicodemus's religion was very much on earthly things, do or don't do, and Jesus was telling about the real meaning of the worship of God. The nature of man cannot worship God, but must be born again. I believe one of the most important things in the New Testament is this conversation between Jesus Christ and Nicodemus, and it is very important for us to understand this real meaning of it. First we should see that Jesus didn't protect the religious system of His people, although they believed they were doing what was pleasing to God. The nature of man, even if he is religious, can never please God. It is very difficult for Nicodemus to understand this. He wasn't going on the right way. But it was better for him to have this conversation with Christ than going his own wrong way. Later, he realized that everything he did before Christ was wrong. It is better for us to understand today, the real meaning of Christianity, that we must be born again, than realizing the sad statement afterwards, that we are going the wrong way. There are some persons whose righteousness is keeping them back from the Kingdom of God. There are also some whose own religion is hindering them from entering God's Kingdom. It is clear from the story, that it is not enough to say that Jesus was a great person, but we must follow his advice. WE MUST BE BORN AGAIN. Now, we come to this question, "But how can man be born again?" Jesus, in His answer, didn't give many details. He makes it clear, as he did with the rich man, that there is a divine act in this process. We need God's help to be born again. And if you ask a practical question, "What should I do now? ", first, you should go to Jesus Christ as Nicodemus and the rich man did. That is the first step, but it is not enough. The next step would be to follow Jesus's answer - to follow His advice to realize that what He says is TRUE. You should be born again. Then you need to ask God to make this wonder in your life. God has promised that everyone who calls on the name of the Lord will be saved, so if you ask Him to help you, He will do it. Then there is another song, and I give some closing sentences. GRN has recorded a version of this script in 16 languages and dialects. See full list. If you have any comments or suggestions about this script, Contactez le numéro spécial langues GRN.